Who said garage doors can’t be a style statement? 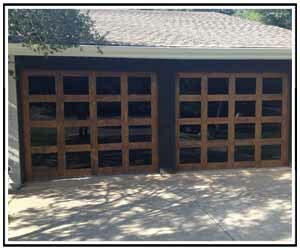 Authentic custom wood garage doors are a fantastic way to add an elegant and uniquely personal touch to your garage, and no one does it better than Overhead Garage Door, LLC. Our wood garage doors use premium quality wood and are built from the ground up by expert craftsmen and designers to match your particular vision. While steel or aluminum doors are often limited to a few basic designs, wood doors can be made in nearly any style ranging from the classic to the ornate. 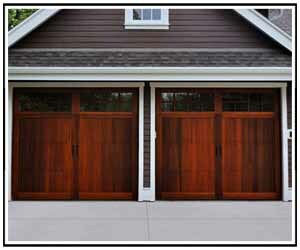 Because they’re custom-built, wood doors can also be made to fit any size or shape of garage. Perhaps best of all, wood garage doors are constructed from a clean, renewable and fully biodegradable resource. Questions About Dallas-Fort Worth Custom Wood Garage Door Options? Cedar has long been among the most popular choices for wood garage doors, and with good reason. The deep, rich color and grain pattern creates an elegant aesthetic that looks fantastic in nearly any application, and cedar maintains its beautiful color for much longer than many other woods. While some species of wood are susceptible to deterioration under adverse conditions, cedar garage doors are ideal for almost any climate. Cedar contains naturally-occurring tannins, which act as a barrier for harmful things like bacteria, fungus and other damaging parasites. This means cedar garage doors require significantly less maintenance and are much more durable in most conditions. As an added benefit, cedar is relatively lightweight and easier on garage door opening mechanisms. When it comes to contemporary wood garage doors, there truly is something for everyone. They can be made to virtually any specifications, and the design possibilities are endless. We offer color staining, distressing techniques and decorative hardware to produce precisely the look you want, and custom hand-crafted windows can really set your garage doors apart. Of course, contemporary wood garage doors offer much more than just stylish looks. Our high-quality materials and fine craftsmanship ensure that your garage doors will last for many years, even in harsh conditions. Custom wood garage doors also act as an excellent insulator and sound barrier, keeping nasty weather and loud noises outside where they belong. Wood garage doors may look like a million bucks, but fortunately they don’t have to break the bank. We place great value on quality and craftsmanship at Overhead Garage Door, LLC, but we also take pride in providing attractive, affordable solutions for almost any budget. If you’re in the market for new garage doors, simply schedule an appointment and we’ll work to make sure you get the doors that are just right for you. We’ll help walk you through all of your many options, review wood garage door installation costs, provide a free estimate, and deliver superior results at a competitive price. See the Custom Cedar Door Options or choose from the Basic Cedar Door Designs. So what are you waiting for? Contact Overhead Garage Door, LLC today!